The Steel City Fins Parrot Head Club was started at the Pittsburgh St. Patrick's Day parade in 1994. Club founder Karen Murray was cold from the parade and decided to go a local establishment for their famous only sold on St. Patrick's Day, mutton stew. The stew was great, and they had a very Irish looking entertainer by the name of John McDonald singing Irish tunes. He sang Danny Boy which brought tears to the eyes of Guinness soaked souls and then asked if there were any Parrot Heads in the crowd. Karen raised her hand and requested "Get drunk and screw". John said that was the earliest in the day he had ever gotten that request but he thought the crowd would appreciate it. John came over on his break and asked Karen if she would like to start a club in the Pittsburg area. He gave her Scott Nickerson's name......and as they say the rest is history. Our first volunteer activity was The River Sweep, held every spring to get the trash off the Pittsburgh river banks. On August 10, 1994, we had our official first fund raiser. It was called "Trop-Rock on the River" and it was held on the "Gateway Party Liner". John McDonald and the Mango Men were our entertainers and the proceeds went to the Make-a-Wish Foundation. One of the couples on the boat was Sally and John Balogh, and they are still active members to this day. Of course, we set aside time to “party with a purpose” and our biggest fund raiser every year is the annual Cabin Fever party, held in February. Parrot Heads from clubs all around the region phlock to this event for great food, entertainment, and infamous pool games. Net proceeds go to charity every year. Cinco De Mayo Crawl and the Fall Crawl are yearly social events which benefit different charities. Monthly happy hours throughout the year, our pre-concert party the night before Jimmy Buffett is in town and of course, tail-gating and partying with the main Parrot Head himself concert day keep the energy alive in Pittsburg. A large entourage makes the annual trek to Key West for Meeting of the Minds. 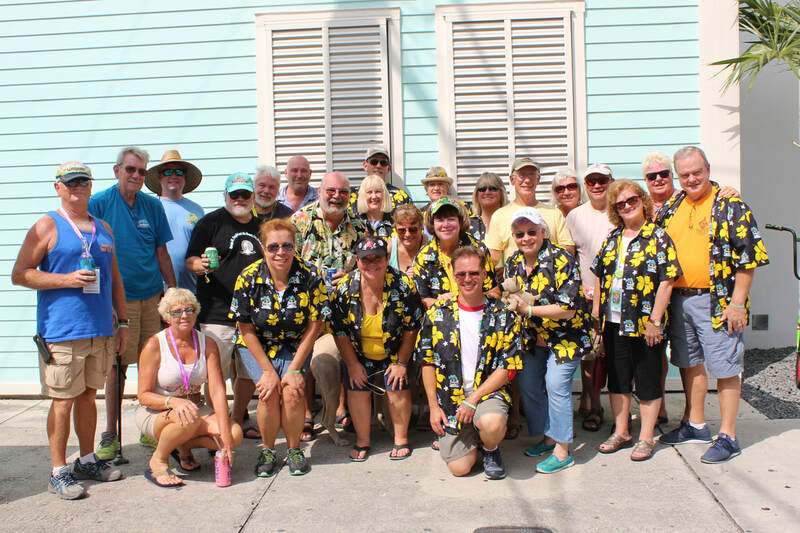 We also support 2 of our very own musical talents that perform in the spirit of the islands, aforementioned co-founder John McDonald & the Mango Men and Tom (“The Buffett Man”) Watt and his Fruitcakes Band (Tom was selected to be Jimmy’s photo double during the filming of the movie “Hoot”). They can always be found in the region helping to bring a little of the tropics to Pittsburgh. We are very proud of where we have been and look forward to many more years of contributing to the community and having phun with Parrot Heads from all over. So far, “It’s been a Lovely Cruise". Mike Polombo, Karen Murray, and Sherry Carpenter members of the club wrote this article about The Steel City Fins.